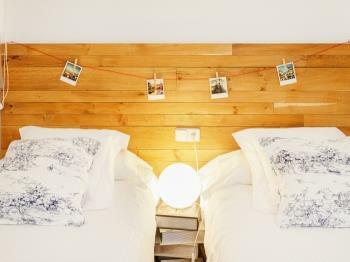 The best option for Gaudi lovers is the Sagrada Familia II apartment (HUTB-010429) which is located in a quiet street of the Sagrada Familia neighbourhood, just a stone’s throw from Gaudi’s masterpiece the Sagrada Familia. 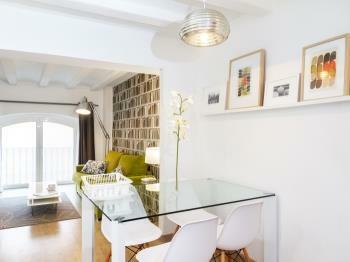 The apartment has just been completely refurbished and tastefully decorated in contemporary Barcelona style. The apartment sleeps up to 4 people in comfort. 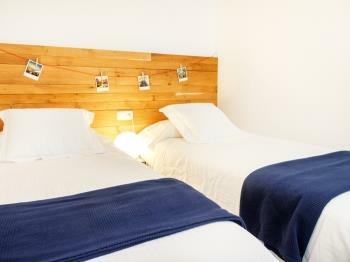 The master bedroom has a double bed and there is a second bedroom with two twin beds. 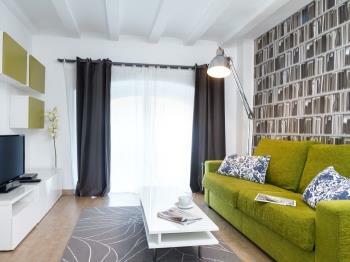 There is a comfy living area where you can relax after a hard days sightseeing, this comes with a TV, DVD, WIFI, double sofa bed, air conditioning and heating. 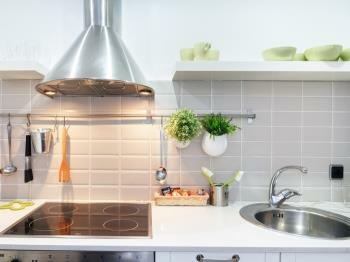 The kitchen here comes fully equipped with everything you need to prepare a meal. 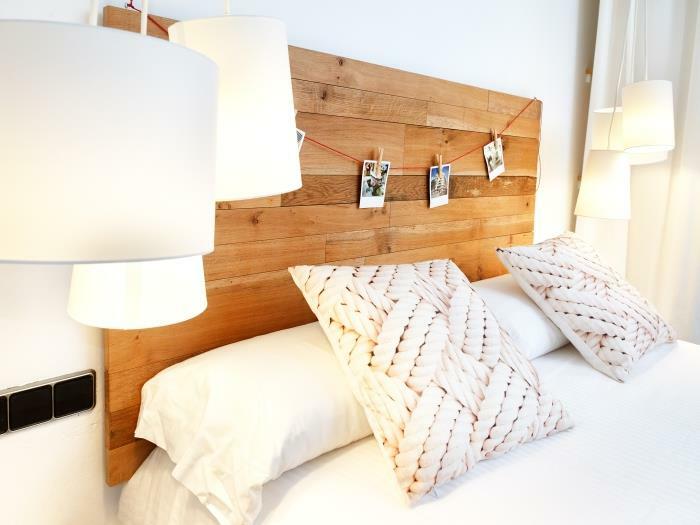 This comfy modern apartment in Barcelona is ideal for two couples or a small family looking for a stay away from the hustle and bustle of the busy Old Town district. This apartment has a master bedroom with a double bed and a second bedroom with two single beds. The master bedroom has access to a small balcony that overlooks an inner courtyard of neighbors, where you will find the washing machine and you can wash and hung your clothes if you need it. The living room is perfect to rest after a long day of visiting the city. Equipped with flat screen TV, DVD and a dining table with chairs; it also has a sofa bed. 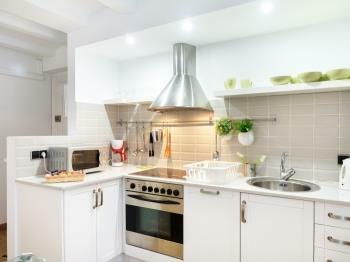 The kitchen comes fully equipped with modern appliances and utensils so you can prepare your meals at home if you wish. In the bathroom there is a modern shower and you will find a hairdryer. The building is a classic building with no lift. The apartment is located on the first floor. You can contact us by e-mail or telephone if you need to clarify doubts about your arrival. A member of our staff will go to the apartment on the day of your arrival and will check in with you. During your stay, we will put at your disposal a telephone number with 24 hours coverage. Sagrada Familia is a central and active neighborhood of Barcelona, interesting because it hosts one of the most important and impressive monuments of Gaudí: La Sagrada Familia. The area has many visitors and is full of bars and restaurants offering a wide range of possibilities. 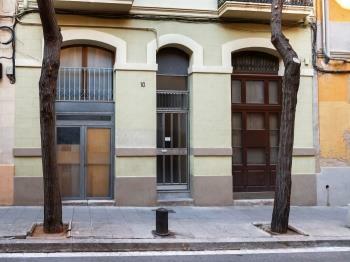 For example, on Avenida Gaudí you will find many terraces from where you can enjoy a drink or eat outdoors. Another interesting place nearby is the modernist complex of the Hospital de Sant Pau, with a very quiet landscaped interior space and a monumental area with impressive details. The advantage of this apartment is to have all this offer nearby and at the same time be located in a very quiet semi-pedestrian street. The nearest metro station is Sagrada Familia, where the L2 - violet and L5 - blue lines pass. The L2 - violet, will take you to the Passeig de Gracia, where you can visit Casa Milà and Casa Batlló, two buildings designed by Gaudí. From there, you can take the metro L3 - green to Drassanes if you wish to visit Port Vell or the Acuarium. There are also multiple bus lines nearby that will take you to the center, to the beaches, or to other points of the city such as Parc Güell. If you are interested in visiting a specific point of the city, during the check-in you can ask us how to get there and we will guide you. The apartment (HUTB-010429) has a master bedroom which has a double bed and exit to a little balcony that leads to an inner courtyard, and a second room with two single beds, so it can accommodate up to 4 people. The lounge is ideal to rest after a long day of visiting the city. 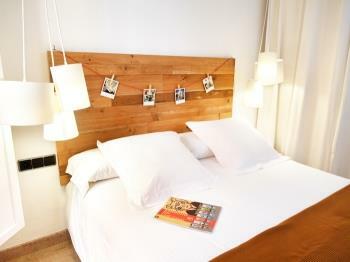 This room is equipped with a flat screen TV, DVD and a dining table with chairs; There is also a comfortable sofa bed. The kitchen comes fully equipped ready to prepare some of the delicious fresh products that can be bought in the Mercat de la Sagrada Familia, just 5-10 minutes walking from the apartment. 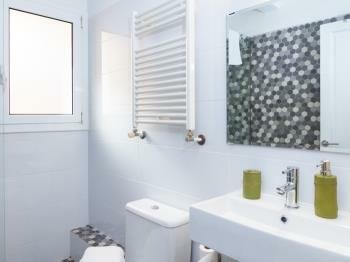 The bathroom is equipped with a shower and you will find a hairdryer. 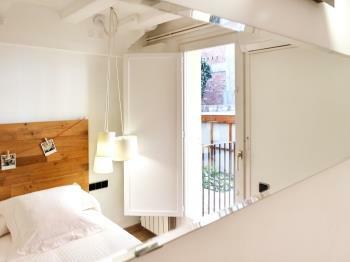 Finally, this apartment in Barcelona has air conditioning and heating, as well as free Wi-Fi and free cot (upon request). 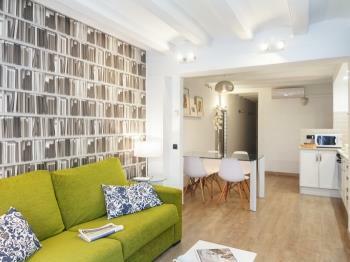 In short, this central apartment is ideal for families with small children, or for two couples, who seek to enjoy the charm of Barcelona without the need to be in the middle of the chaos and bustle of Barri Gótic.